The ultimate side-by-side in every way, the radical Pioneer 1000-5 delivers more inside and out, front to back. It starts with a class-leading 999cc twin-cylinder engine. The industry’s first and only fully automatic 6-speed Dual Clutch Transmission. And Honda’s exclusive QuickFlip® seating that allows you to go from a 3-seater, to a 4-seater, to a 5-seater. But it doesn’t stop there, because the Pioneer 1000-5 also has a fully-selectable driveline that lets you choose between 2- and 4-wheel drive, and open or locked differentials front and rear. A high/low dual-range subtransmission. Fully-independent suspension in the front, and the back. And a hauling capacity of 1000 pounds, with a towing capacity of a full ton. The 1000-class Engine You’ve Been Waiting For: The Pioneer 1000-5 features an all-new, purpose-built engine designed just for these vehicles. Displacing a class-leading 999cc, the inline-twin Unicam® design offers the power and performance that set the Pioneer 1000-5 apart from anything else in its class. Fully-Automatic Six-Speed DCT Transmission: Another huge difference compared to the rest of the field. The Pioneer 1000-5’s Automatic DCT transmission features tough steel gears and shafts, with no belts to burn up or torque converters to steal efficiency. Paddle shifter provides driver choice of gear selection. And you get real compression braking for better control, and a more connected feel in all conditions. Multiple Seating Options: Able to carry anywhere from one to five occupants, the Pioneer 1000-5 features a three-place bench seat up front along with a pair of QuickFlip® rear seats in the back. The two additional passenger seats fold flat when not in use, giving you unrestricted bed access and superior capacity. 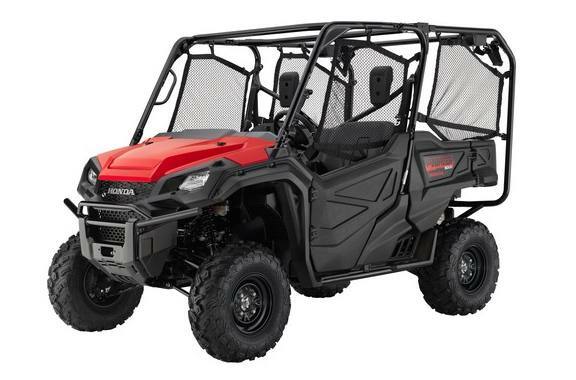 Chassis and Suspension: Engineered for uncompromising comfort and capability, the Pioneer 1000-5 features 27-inch tires, 10.5 inches of front suspension travel and 10.0 inches in the rear, and over a foot of ground clearance, so it’s built to take on your biggest adventures. Accessories: With over 70 accessories available, you can set up the all-new Pioneer 1000-5 for just about any job. We even have special packages for hunters and fishermen, utility work, and recreational outdoors use. Powerful 999cc Twin-Cylinder Engine: A flagship Side-by-Side starts with a flagship engine, and the all-new Pioneer 1000-5 features one of our best. A class-leading 999cc liquid-cooled inline-twin, it’s the largest in the industry. And it’s also one of the smartest, utilizing Honda’s proprietary Unicam® cylinder-head design, perfected in our high-output motocross bikes. Built specifically for the Pioneer 1000-5, the engine is specially tuned to produce the horsepower and torque this SxS demands. Engine Air Intake: Designed to excel in off-road use, the viscous air-filter element does an excellent job of providing clean air to the engine under tough conditions. It flows air well for increased performance, and also provides a longer service interval. Fully-Automatic 6-Speed DCT Transmission: The Pioneer 1000-5’s Automatic DCT transmission features paddle shifting, six forward speeds plus reverse, three shift modes (automatic, manual and sport )and two gearing ranges (high and low). It can do all the shifting for you, as smooth and seamless as any automatic, but can also give you total control to shift yourself—it’s the best of all worlds! High/Low Subtransmission: In some really tricky, rocky terrain, hauling a big load down a steep hill, or need some real hill-climbing ability? This is just the ticket. A full 42-percent gear reduction is available when you shift from High to Low range. Advanced Transmission Logic: The Pioneer 1000-5 is more than tough—it’s Honda Smart. Here are some examples: The Pioneer 1000-5’s advanced, fully automatic Dual-Clutch Transmission senses how you’re riding, monitoring throttle position and input, engine RPM, vehicle speed and more. Relaxed drivers get smooth shifts and lower engine speed for a smoother, quieter ride. More sporting drivers get quicker shifts and higher engine speeds to maximize engine torque and power. Going downhill? The Pioneer 1000-5 stays in a lower gear for superior engine braking. Paddle Shifting: You can let the Pioneer 1000-5 shift automatically, but if you want to choose a specific gear, upshift or downshift yourself in demanding conditions and even override the automatic gear selection—all without ever moving your hands from the wheel. The Pioneer 1000-5’s twin paddle-type shifters make it easy and fun. Turf/2WD/4WD/Diff Lock: Total flexibility here, with one lever. Turf mode is perfect for sensitive surfaces (like grass fields) and provides easier steering. Rougher conditions demand four-wheel drive to maximize available traction. And when the trail becomes even more demanding front and rear differential locks drives direct power to all four wheels. Automatic Load Leveling Rear Suspension: When you fill the two rear seats or put a bigger load into the Pioneer 1000-5’s bed, the rear suspension automatically senses the increase and adjusts the ride height to compensate. This maintains ground clearance and maximizes comfort when loaded. Independent Suspension Front and Rear: With over 10 inches of front-wheel travel and 10 inches in the rear, the Pioneer 1000-5 also offers generous ground clearance. You get a smooth ride, and improved traction in rough conditions. Four-Wheel Disc Brakes: With a vehicle as big and capable as the Pioneer 1000-5, you need brakes that are up to the job, too. Honda’s extensive automotive experience means you know the Pioneer 1000-5’s brake system is up to the task. Chassis Refinements: The Pioneer 1000-5’s chassis may not be the first thing you see, but it’s one of the first things you’ll notice when you’re on the trail. The independent, long-travel suspension, excellent ground clearance and large tires all work in concert to deliver superior ride comfort and superb traction. The rubber-mounted engine and exhaust system insulates you from annoying vibration, so your driving experience is like riding in first class, not economy. And on the Pioneer 1000-5, a special self-leveling rear suspension automatically compensates for changing loads. QuickFlip® Seating: The Pioneer 1000-5’s bed features a pair of seats that flip up or fold down independently in seconds. Up, they provide secure seating for one or two additional passengers; down, you get a true flat cargo bed surface for utility use. 3-Passenger Contoured Bench Seat: Designed for three, this seat might even be more comfortable than your sofa at home! With a durable covering, it’s built for all-weather use, and to hold up to the rigors of off-road use. The center seat is positioned up and forward to increase comfort and maximize space for all three passengers. Driver/Passenger Protection: The Pioneer 1000-5 is loaded with features to help provide a feeling of security for the driver and passengers. The Occupant Protection Structure uses sturdy, large-diameter tubing, and includes integrated handholds, recessed top tubes and a more spacious structure to enhance protection; it also meets OSHA’s 1928.53 rollover protective structure standard. Hard doors and roll-up side nets provide a secure feel and keep mud and debris out of the cabin, while automotive-style three-point belts with an Emergency Locking Retractor mechanism help keep everyone secure. Tilt Wheel: One size never fits all—that’s why the all-new Pioneer 1000-5 gets a tilt wheel to let you find a position that’s right for you. It also makes getting in and out easier for the driver. 2000-Pound Towing Capacity: Able to tow a full ton (2000 pounds), the Pioneer 1000-5 can take on big jobs that otherwise would have required a tractor or a truck. 1000-Pound-Capacity Tilt Bed: You can load a full half-ton into the Pioneer 1000-5’s bed. And when it’s time to unload, the bed’s tilting feature makes dumping firewood, gravel, sand, or other items easy. LCD Display: All our Pioneer 1000 models feature deluxe, multi-function LCD dashboard instrumentation that displays fuel level, engine speed (rpm), vehicle speed, tripmeter, odometer, a clock, gear position and much more. Built in the U.S.A.: The Pioneer 1000-5 is built especially for the American market—totally in tune with your wants and needs and built in Timmonsville, South Carolina using domestically and globally sourced parts.